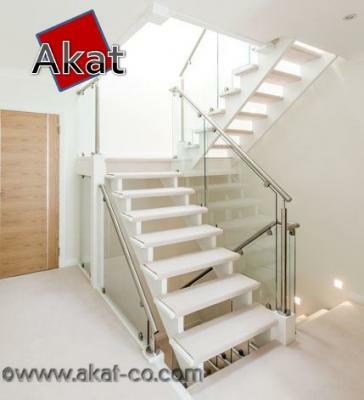 Akat is a designer of all kinds of glass fences such as glass curtains, balcony glass fences and glass stair railings. آکات فروش و اجرای انواع نرده شیشه ای با قطعات و اتصالات درجه یک با مناسب ترین قیمت. نرده تمام شیشه ای از شیشه های سکریت ولمینت با ضخامت های 8 تا 20 میلیمتر. Akat is one the best in producing, designing and installing the glass railing, fence and stairways the middle east . glass railing and stairways /glass fence balcony /Akat glass fence / glass railing components, glass fence price. Sales and implementation of various grade glass fence with top-notch components and connections and the most reasonable price. The whole glass fence from Secorit and Laminate with 8 to 20 mm thickness.